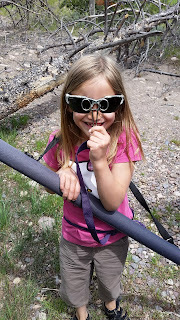 My soon to be eight-year old daughter and I took a day trip over the continental divide and into new trout country to us. We'd planned to do so when school ended for the summer. The premise was fishing. The idea was to explore new creeks and look for some dry fly action. It didn't really go all that well from my perspective, at least as viewed through the lens of my expectations. I'd planned to write about the trip and took mental notes in preparation. I had essentially scrapped the idea late in the day, thinking there really wasn't much to tell - and then found that my daughter had already written about the trip. 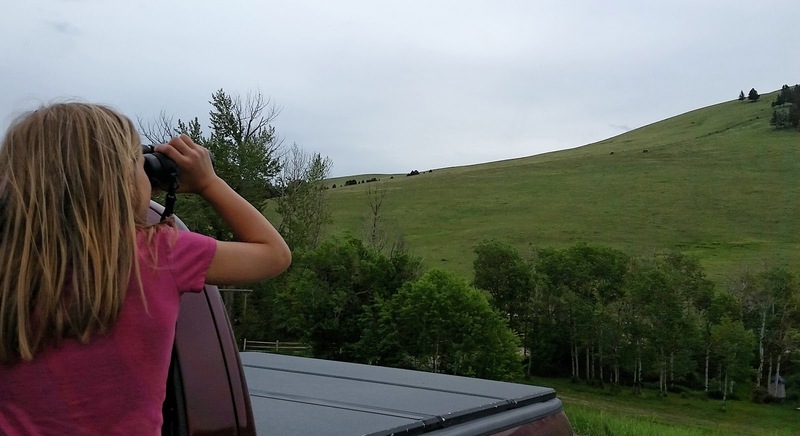 She'd captured the day's events in a little notebook in the back seat of the truck. Eight short pages of dedicated second-grade scrawl made over bumpy roads. Fresh insight into her day, and how she'd seen it through something other than my expectations. We left the gas station with freshly washed windows, streaked in the places she couldn't reach very well. 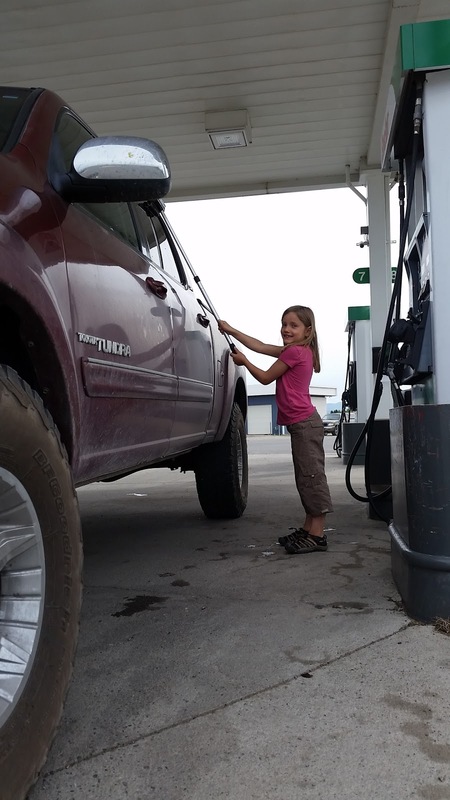 She loves to wash the windows of my truck anytime I'm pumping gas. Doesn't matter the weather. She tore into the little treat we'd bought from the candy racks and shared a bite with me. Beside me in the front seat our fly rods rattled and buzzed. She had a new one that was all her own. Ratty Montana road maps used to the point of falling apart lay under them. Leaving the house had been delayed when at first I couldn't find these maps. Our waist packs were on the floor boards with the fly gear for the day stuffed into them. Her little purple bag contained a box full of "the pretty ones" she'd selected from my fly boxes earlier that morning. 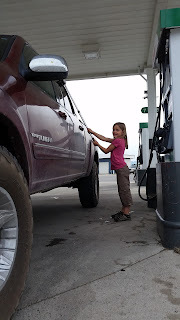 When the pavement gave way to dirt and we found ourselves in the cloud of dust kicked up by the farm truck in front of us she announced from the back seat "Wasn't very useful to wash the windows!" As the road began to wind more tightly and rose above the valley floor, she spotted an elk "before dad." To celebrate I pulled over and got my binoculars out so she could glass it. Eventually one became four. Further down the road and back out onto some pavement we came to a halt behind some cowboys moving a herd. 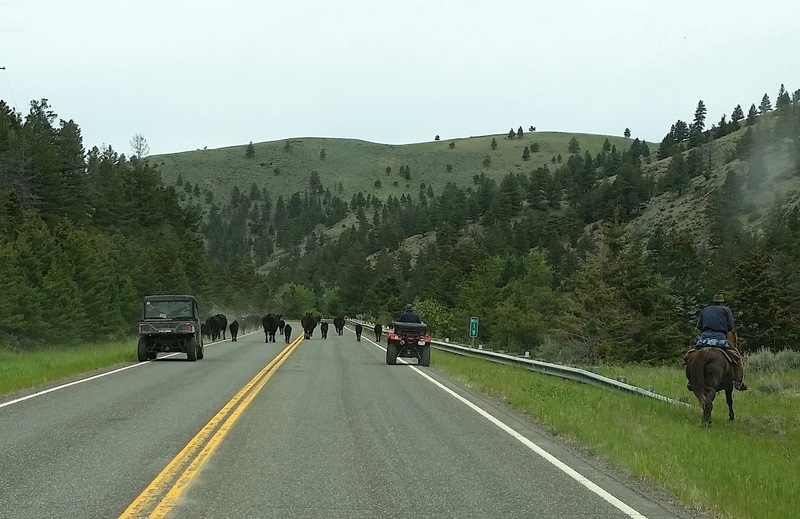 It's pretty common to sit for a while as a road - even main roads - become the thoroughfare for a rancher to switch pastures. The first creek we tried was so tiny by the time we hit Forest Service it wasn't worth it. 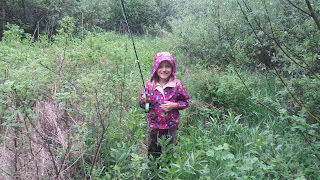 We didn't break the rods out, but my daughter was immediately out the door of the truck and bombing off into the brush downstream. I'd yet to take the keys out of the ignition. We crossed to a tiny island. We analyzed some of last fall's buck rubs. Took note of a pile of moose droppings. And then she picked a sample of every wild flower represented in that little valley. 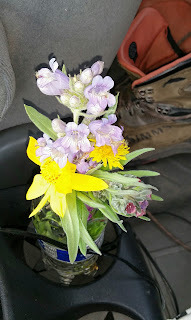 At the next stop on the other side of the mountain she added more flowers - and a handful of snails plucked from rocks in the stream - to the ever-growing bouquet. To hold it all she filled a water bottle in the creek and stuffed them into it. The snails took to climbing the stems and sticking to the walls of the bottle. We spent some time casting at this stop. And really it was our best fishing of the day - room to cast, clear water, hatching bugs, etc. Saw a couple fish, but had no action. I moved us on because this water was relatively big, and I was convinced we could find a small creek loaded with eager fish. But we didn't find it. Mostly we found swollen streams full of snow melt. Or No Trespassing signs. Or streams choked so full of dogwoods and willows there wasn't any room for a beginner to enjoy themselves. Then, at our final stream, a powerful storm set in, and rained us back to the truck with soggy jackets. We were out of time. Even at that, we pulled over at another spot or two on the way home, but the rain was still more than convenient to venture out into. Oh well, we'd had a good day. We had explored. We'd eaten our packed lunches. We'd seen wildlife. We'd laughed. We'd shared moments of me carrying her across streams, untangling her fly line, fetching it from trees, and soaking in rainstorms. Still, I was bummed. I felt like we'd bounced from place to place, never finding the right fit. It wasn't what I'd envisioned. We never even had a hit, and had spent far less time fishing than I'd intended. The idea of writing up a blog post to showcase our long awaited day seemed distant and unlikely. But then she read aloud the first several pages of what she'd written as we rolled down the highway with rain drumming on the roof. She's always writing stuff down. Making lists. On this trip she'd recorded every animal we'd seen or had noted sign of. She planned to "study" the trout. She drew a picture of me casting a fly - then later changed it to show me casting in a rainstorm. But her journal entry about the trip showed me that more had happened than a botched fishing trip. The outing still contained all the other elements we'd set out to find. The comradarie. The daddy daughter time. The outdoors. Here is her story, in her words and creative spelling, without prompting or translation from me. It's not that much different from my own account, but it's freer, untainted by expectations or other measures of what define success. Emphasis doesn't differ from breakfast to flowers to fish or sightings of wildlife. Fishing was just the instigator. The trigger that caused the adventure to happen. 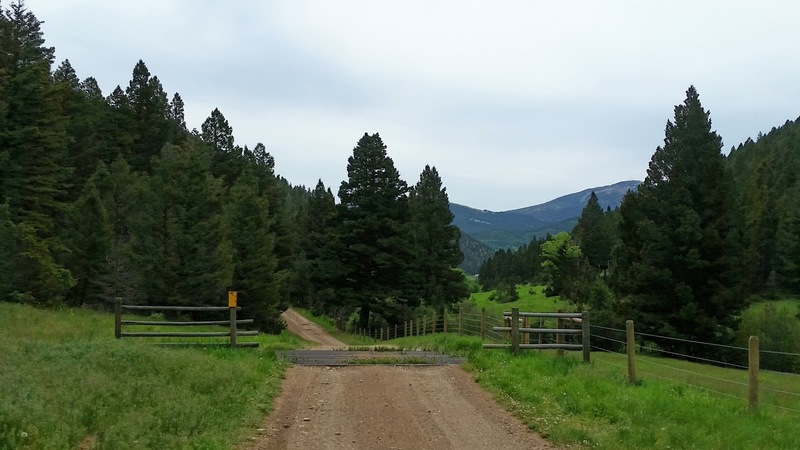 "Me and Dad desided to go on a flyfishing trip together. We woke up, ate breakfast, and got dressed. Then we couldn't find the maps. Finally we found them behind the seat in the car. Then we started going but, it was a very long long drive. On the way I spoted my first elk that I saw first. I looked through banoculers to see what animal it was. I was glad it was on private land so it wouldn't get shot. I hope it stays. Also on the way we stoped in moose, deer, and elk country and I found lots of pretty flowers and I kept them. And on the way there back from visiting moose, elk, and deer country in the spot I saw my first elk there was four elk and a little farther there was three deer. We're almost there over and over sang me. We saw lots of animals. We tried blackfoot river and then dad said he had a close one so we started to go there then after a while we stopped. Dad was trying to figure out where we were on the map. Then we kept going. Ad - we found snail shells at blackfoot river. When we got there we ate some snacks then went and fished but barely. Then it started to rain. First we thought it was fine but then harder so we put are rain jackets on then it rained harder so we started back. On the way we stopped and fished a little. When we got to the truck we were soaked. Then we got in the truck and ate snacks then we desided to go to another creek. When we got there we didn't fish cause it was raining hard and there was thunder and lightning. So we planned to go home. So we started to go then dad spotted a elk. I didn't see but I spoted a whole herd of elk he didn't see. Ad - Dad slowed for a deer in the road on the way home. Then dad saw four elk and I saw them too. Then we kept going. Then I started to be really funny that we kept going. Dad had a phone call with Mommy and she was going on a Daddy daughter thing with Papa* so Dad would stay home with us. (Us means me and my brother Cooper). Then we kept going. Nothing was very exicting. We went home, had dinner, and the rest of what you do after dinner.